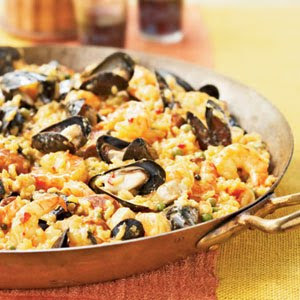 Paella, the traditional Spanish dish with shellfish and saffron flavored rice, is one of my favorites. In it's original form it is cooked over an outdoor fire. I don't have that luxury, so I was happy to find this easy version on Gourmet.com. It turned out great. Somehow more like a latin jambalaya. I left out the peas, and traded clams for mussels. Delicious. Heat oil in a 12-inch heavy skillet over high heat until just smoking, then sauté garlic and frozen onions and peppers, stirring, until garlic and onions are golden, about 2 minutes. Add kielbasa and cook, stirring, until kielbasa is lightly browned, about 2 minutes. Add rice, wine, broth, saffron, and shrimp and cook, covered and undisturbed, over high heat until most of liquid is absorbed and shrimp are cooked through, about 6 minutes. Stir in cockles, peas, and olives and cook, covered, until cockles open wide, 2 to 4 minutes. (Discard any cockles that remain unopened after 4 minutes.) Remove from heat and let stand, covered, until all liquid is absorbed, about 5 minutes.